We broke down data from some of the largest ISPs by the numbers they serve and the areas where they serve. The report provides insight into where each company has a lock on the market, even while they claim that there is “too much competition.” With maps and related sources to help explain how a small number of ISPs are capturing large swaths of subscribers, the report will help clarify confusion and dispel misinformation. : The telecom companies have invested in Fiber-to-the-Home in areas where they face competition, which are generally more urban areas. The advent of Google Fiber in 2011 further increased the competition in urban markets. Efforts to increase investment from the largest firms in more rural areas have largely failed. Though states have varied regulations, the same trend results in every state -- investment by the large ISPs is correlated to competition rather than the regulatory environment. This reality does not suggest that competition between a cable monopoly and a telephone monopoly is sufficient for high-quality Internet access, but it clearly helps to ensure connections at the minimum definition of broadband. 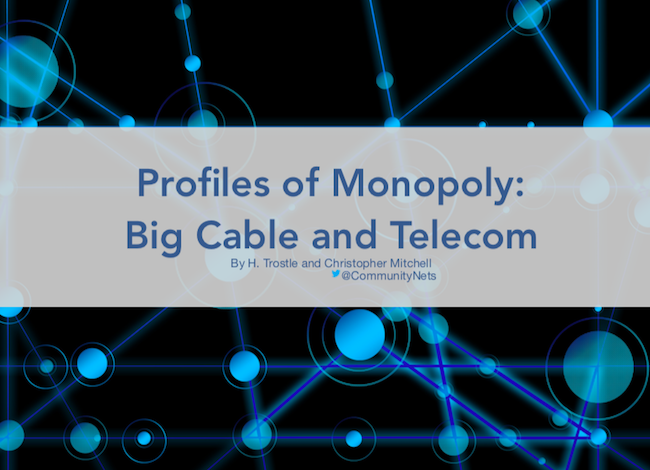 Download Profiles of Monopoly: Big Cable and Telecom to learn more about the realities of competition in today’s broken market. We encourage you to share the report and spread the word about the state of America's broadband monopolies.